If you’re used to listening to your music with your iPod’s Shuffle Songs feature, you may like to do the same with iTunes 8—when you’re chilling out, working, or having a party. The iTunes DJ feature—formerly called Party Shuffle—lets you choose random songs and play them, but gives you a slew of ways to control the play order. Not only can you do this from your Mac or PC, but if you have an iPhone or iPod touch, you can use Apple’s free Remote app to “vote” for songs in the iTunes DJ playlist, and make requests, adding songs that aren’t in the playlist to the next-up position. First, you need to check out how iTunes DJ works. If you don’t see this playlist, check iTunes DJ in the program’s General preferences. The playlist appears at the top of the Playlists section in the iTunes Source list. To choose music for the iTunes DJ playlist, click on the Source popup menu at the bottom of the iTunes window: you can choose your entire library (Music) or any of your playlists, including the Purchased playlist, if that’s available. When you select a source, iTunes fills the iTunes DJ playlist with a number of songs corresponding to the number in the feature’s settings. (See below for more on settings.) By default, this is five recently played songs—they show as dimmed—and 20 upcoming songs that are queued up to be played. You’re not stuck with this selection though. If you don’t like it, click on the Refresh button at the bottom-right of the iTunes window, and a new set of songs fills the list. If there are specific songs you don’t like, you can just select them and delete them; new songs will be added at the bottom of the list. If you want to change the order, just click on any song and drag it to the top or bottom of the list, or anywhere in between, to make your own segues. If you control-click on a song—anywhere in iTunes, not just in the iTunes DJ playlist—you’ll see a contextual menu with options for this playlist. You can choose to add a song to iTunes DJ (play right away in iTunes DJ), have it play next (after the current song), or Add to iTunes DJ, which adds it at the end of the playlist. The iTunes DJ window shows you the usual information about your tracks, and the contextual menu lets you add more songs to this playlist or choose to play one right away or after the current song. Here’s what your friends see when they connect to your iTunes DJ playlist from their mobile device. With Apple’s Remote app for the iPhone and iPod touch, you have additional ways of controlling the iTunes DJ playlist. If you click on the Settings button at the bottom of the iTunes window, you’ll see some options that affect mobile users. 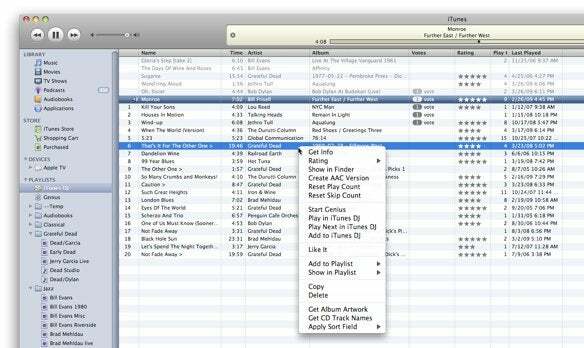 If you check Allow guests to request songs with Remote for iPhone or iPod touch, your friends can connect to your iTunes library and request songs, if they have the Remote app. (You can set a password to protect this access.) If you check Enable voting, your friends can also vote for songs already in the iTunes DJ playlist. Songs that get votes go to the top of the list; the more votes, the higher in the list. 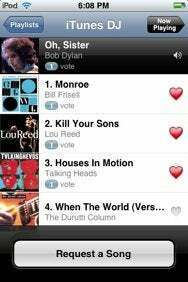 Requests can be made from anywhere in your library, and those songs get added with a vote. You can also “vote” for tracks when in iTunes by selecting them and control-clicking, then selecting Like It. Note, however, that if voting is enabled, you can’t manually drag songs in the list to change their order. Updated at 7:46 a.m. PT to correct the steps for setting songs to skip when shuffling.